This is currently split into two sections, film photography and CCD photography. 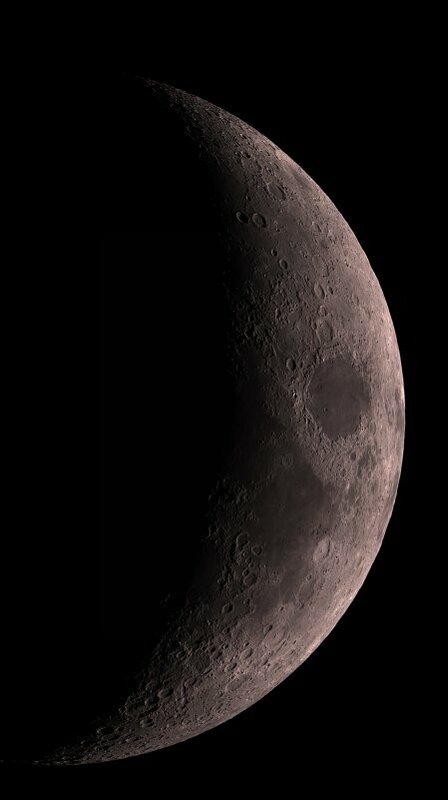 Moon,05/01/2000. 1/250 second exposure f8 9:10. A 1/250 second exposure on Kodak Gold 800. Definate improvements here. Using Clave 20mm and canon fx. Gaussian unsharp masking enhances the image. 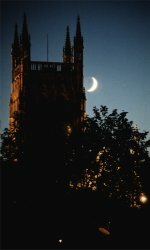 Moon,July 2002 passing over and behind Worcester cathedral. Taken on my doorstep. Unsharp masking only.asa 800 kodak with 200mm zoom.1/16 exp. 3rd march 2006.0.005 sec exp with sxv-h9 and mn56.Large image. 9th May 2006.0.001 sec exp with sxv-h9 and mn56.Large image. 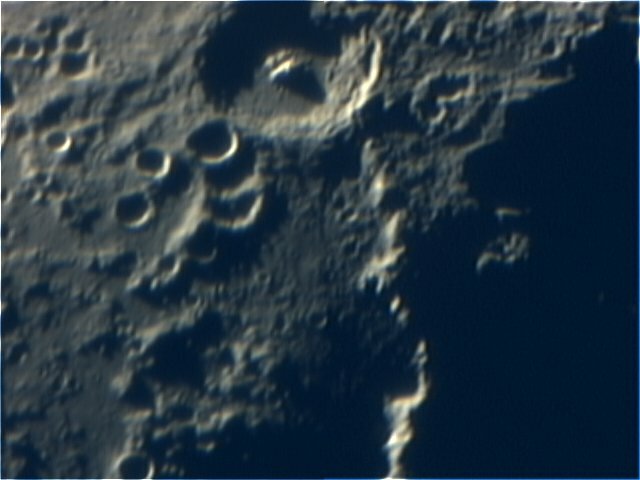 3rd April 2006.MN86 with 5 x barlow. 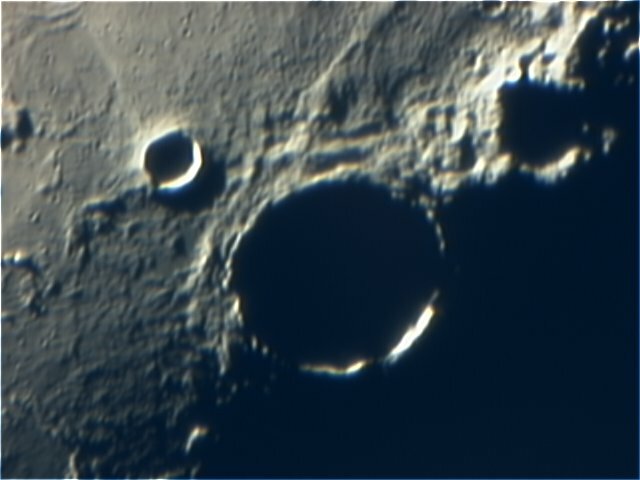 Toucam2 , best of 816 frames from Registax of the crater Theophilus. 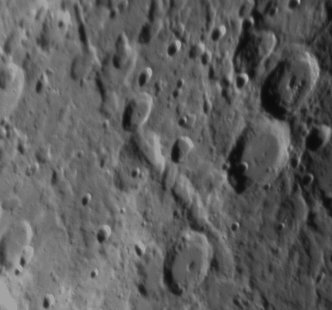 The smaller crater to the top left of centre is Madler.Theophilus is 104 km across with crater walls extending 4400m.Resolution is roughly 488metres per pixel. 3rd April 2006.MN86 with 5 x barlow. 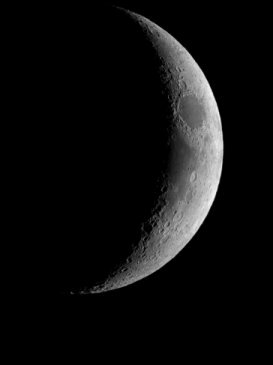 Toucam2 , best of 216 frames from Registax. 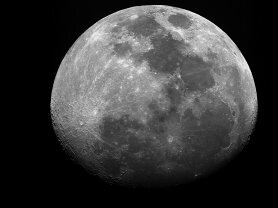 The large crater is Piccolomini - 96km in diameter with walls rising 4500m.Resolution is roughly 488metres per pixel. July 2008 , composite with sxvh9 and mn86 of the Vallis Reita Area. 19th Feb 2013. 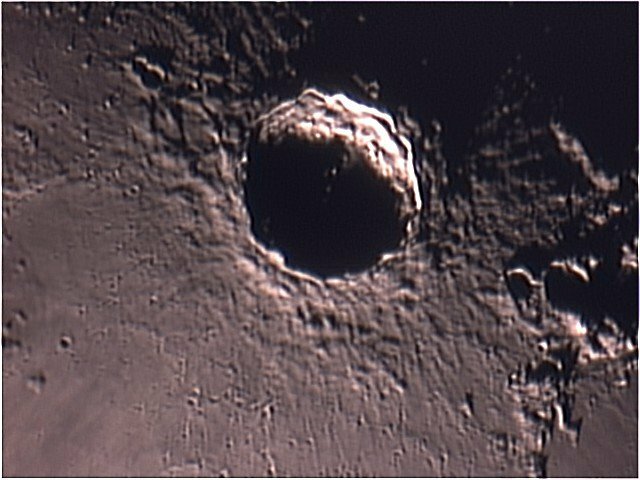 Copernicus crater in sharp relief close to the terminator.93km in diameter with very steep slopes and a height of 3760m. MN86 with 5 x barlow and toucam2. Seeing - average. 19th Feb 2013. 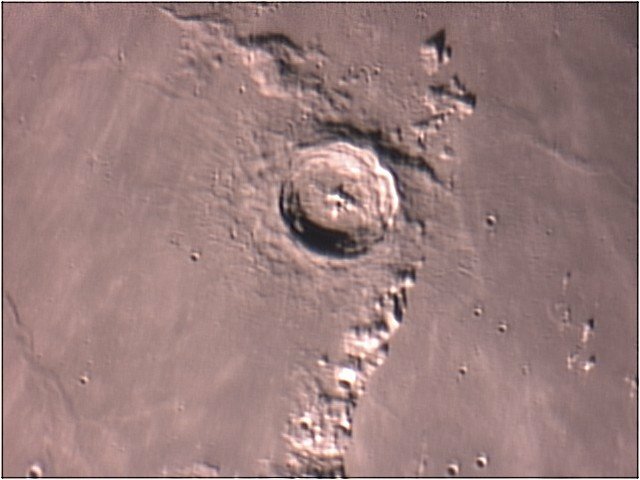 Eratosthenes crater, 60km in diameter , very close to Copernicus. High walled with terraces and reaches 3570m high.MN86 with 5 x barlow and toucam2.Seeing - average. 19th Feb 2013. 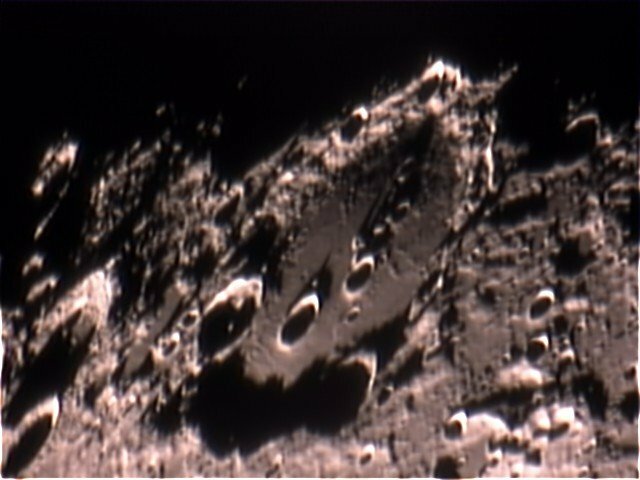 Clavius crater in sharp relief again close to the terminator.225km in diameter with several sub craters. MN86 with 5 x barlow and toucam2.Seeing - average.